In many homes, the rocking chair is more than just a piece of furniture, it is a cherished member of the family. From baby’s first soothing lullaby to grandma’s last peaceful reflections, the rocking chair cradles and comforts each of us with its own special magic. It’s hard to say whether it is the hypnotic motion or the memories of the comfort found there that draw us to that spot when we are tired or upset, but nothing can soothe a weary soul better than a few moments of quiet rocking. Gary Weeks has taken his respect for this time-honored piece of furniture and has crafted a graceful work of art worthy of handing down from generation to generation. His original design combines comfort and beauty with sound structure and impeccable craftsmanship. Prototypes were built and tested, with revisions made to improve the comfort and motion. “At least 1,000 hours went into the first chair,” Weeks explained. Special attention was given to lower back support, the shape of the seat, and the height, angle and contour of the arms. An assortment of custom jigs and fixtures were designed and built to accommodate various stages of production. Special sanders were created to smooth everything from long curving rockers to the rounded ends of legs. The first completed pine model was finally finished and ready for testing. The end result not only works for Weeks’ physique, but also is perfectly comfortable for petite women who are five feet tall and men up to 6’4”. In his Wimberley workshop, Weeks begins each chair with an eight-foot length of rough-milled pecan, especially selected for his shop by the sawmill. Then, the long process of planing and shaping the wood begins. Weeks studies the grain of each board, because the knots and flecks in the wood give each chair its own subtly different personality. Weeks matches the grain of the wood for symmetry, giving the entire chair a flow of motion from one piece to the next. The back of some chairs may be customized with an inlaid state of Texas, star or ranch brand. Most of the 50 rocking chairs Weeks has crafted so far have been made from pecan, but he has experimented with walnut and cherry and is currently constructing 11 chairs out of mesquite. Weeks’ care and concern are not only for appearance and comfort, but for durability and strength as well. For a chair to be passed down through generations, it has to hold together for decades. Rockers and arms are attached using the mortise and tenon method, the strongest kind of wood joint. “It’s as if the arm grows out of the leg, both in structure and appearance,” Weeks explained. The tenons, or pegs, are spread by wedges inside the mortise holes for the tightest possibly fit. The chair’s silky finish is achieved by meticulous sanding and rubbing. Each chair is hand sanded with six different grits of sandpaper, then hand-rubbed with four coats of a tung oil/urethane mixture. Each coat is allowed to dry overnight. “I’ve tried to achieve a satin feel, sheen without gloss, and moisture protection for the wood,” Weeks said. Perhaps some of the inspiration for Weeks’ work comes from the comfort and natural beauty of his work environment. In the large, well-organized workshop behind his home, Weeks can open wide the sets of large doors to let in the sunshine and fresh air. Knickers, the family horse grazes contently outside while Ruby, their dog, stretches out lazily in the sun. Weeks’ children--Austin, 15, Zachary, 10, and Aubrey, 8--regularly pop in for a visit or to work on their own projects in he shop. Weeks can be home for lunch with the family every day. Weeks incorporates waste materials from his shop into a large pile out back. The sawdust is used as groundcover in the chicken coop, where micro-organisms transform the combination sawdust-chicken manure-vegetable scraps into instant compost for the family garden. The Texas Pecan Rocker has found its way into homes in locals as diverse as Anchorage, Seattle, Palm Springs and St. Lewis. A specially designed crate is used to ensure the chair’s protection on cross-country treks. Weeks put in a great deal of thought into the design of the returnable crate in order to make it secure and durable, yet lightweight and easy to open. 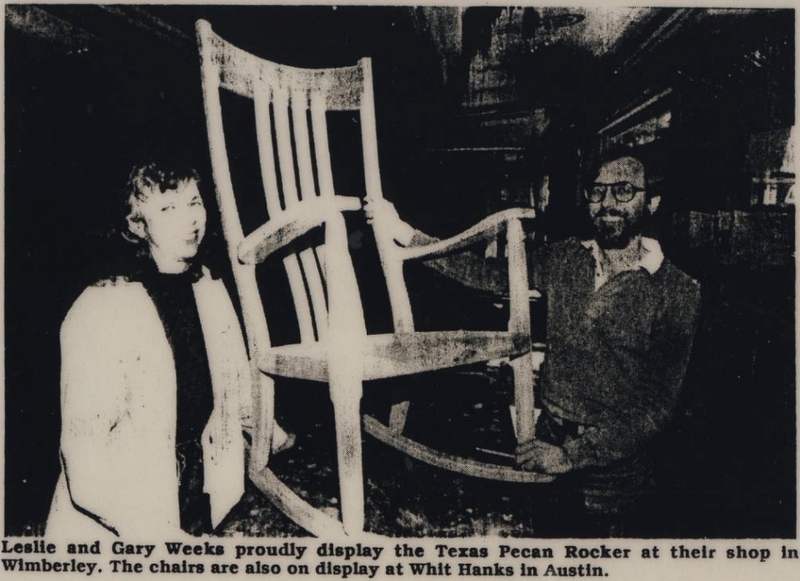 Weeks’ rocking chairs are on display at Whit Hanks in Austin, and may be purchased at that location or from Weeks directly.